Home » What Axle Do I Need? Our Thru Axle Finder Guarantee. 1. Pull your thru axle out and check for dimensions. *First, do you have a proprietary thru axle, such as R.A.T., Naild, Mavic Speed Release or a Surly Bike? If so, visit our Supported Axle Systems Page, here. Many axles now come with the length (L) and thread pitch (TP) measurements printed on the axle. Remove the axle from your bike and double check the dimensions. With those dimensions, skip to Step #4. If you don’t see any dimensions, continue to Step #2. 2. Measure the length of your axle. Print our Fitment Guide. *It is very important that you print to “actual size”. Do not “fit”, “shrink”, or “scale” this page when printing. And be sure to choose the right sized paper version. Measure the straight length of your axle shaft. Do not include the axle head or tapered spacer, if there is one. Axle length is not the same as hub length. A bike with a 12×142 hub standard will have a significantly longer axle. 3. 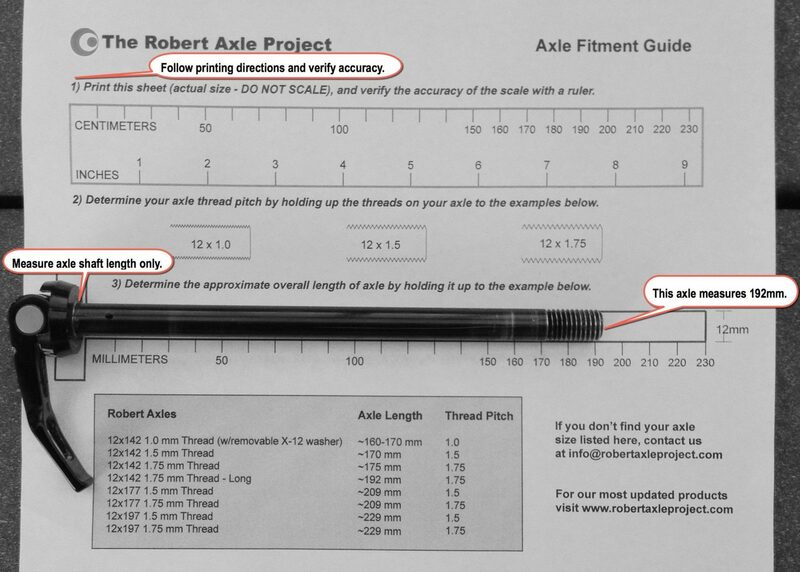 Measure the thread pitch of your axle. Place your axle threads on top of the Fitment Guide. (Double check – did you print the guide to actual size?) Thread pitch must match exactly. 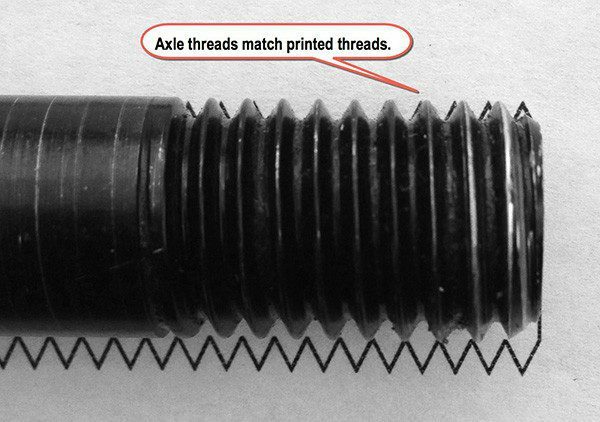 Determine if it is a 1.0, 1.5, or 1.75 thread pitch. 4. Use the tabs below to find the axle you need. 5. Select the Kid Trailer Axle that fits your bike. All axles are compatible +/- 2 mm in length. 5. Select the BOB Trailer Axle that fits your bike. #5. Select the Trainer Axle that fits your bike. 5. Select the Lightning Bolt-on Axle that fits your bike. 5. Select the Front Lightning Bolt-On Axle that fits your fork. 5. Select the Yoke Mount Axle that fits your bike. 5. Select the Thunder Bolt-on Axle that fits your bike.